Used Nissan Juke Review - 2010-present | What Car? What's the used Nissan Juke hatchback like? When the Nissan Juke was launched in 2010, it effectively created the segment for small SUVs, in much the same way the Nissan Qashqai had done for crossovers. Its unconventional styling, mini-SUV stance and raised driving position won many admirers, to the point where it became a common sight among the UK’s top 10 bestsellers. Keen pricing and competitive finance deals have been key to the Juke’s success, while its popularity when new has resulted in a healthy supply of used examples to choose from. It’s easy to drive thanks to light steering and a good view ahead, but the rear styling does mean it has a few blind spots, so consider finding a model with parking sensors. It also has a jittery ride and, while its body doesn’t lean too much in the corners, it isn't a particularly entertaining car to drive. Engine options include a diesel and two petrols, with the top-of-the-range turbocharged 1.6 DIG-T offering sprightly performance. Not only that, it is available with four-wheel drive, although only with a CVT automatic transmission. For those in the market for a performance SUV, Nissan also offered a tuned Nismo version of the Juke that was reasonably entertaining to drive in its own unconventional way, feeling much like a hot hatch on stilts. 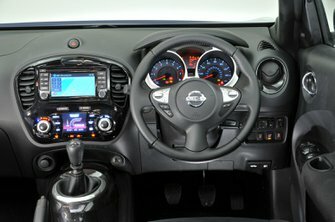 Where the Juke doesn’t fare so well compared with rivals is in interior space. Put simply, there’s not a huge amount of it, particularly in the boot. To give you a guide: even a Ford Fiesta offers more room for luggage. Rear passenger space is tight, too, so taller adults will find their head brushing the roof lining. 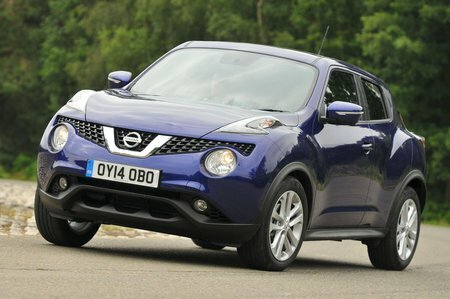 The Juke is also too narrow to sit three adults side by side. Boot space on facelifted cars from 2014 onwards is better, but it’s still by no means class-leading. On every Juke, the shape of the boot opening itself limits what you can carry. Trim and build quality were improved on the facelift, mind you, and an additional 1.2-litre turbocharged petrol engine was offered.